So what are you waiting for? TheAutoTitleLoan.com is a trusted source for loans. Our company provides friendly service, with quick loan processing, in order to get you the money that you need as fast as possible. Get in contact with us today by calling our toll-free 800 number, and get started on your loan today! We look forward to serving you in all of your title loan needs. Car Title Loans allow you to take advantage of the equity you have in your car without selling your car. Car Title Loans, which are also called Auto Title Loans, Title Loans, Auto Pawn, or Pink Slip Loans, will put quick cash in your hands while you continue driving your car. These loans are a very popular way to borrow money. They are used by individuals and are also used by small business owners as a form of Small Business Loan. And they have big advantages over Payday Loans. An Auto Title Loan allows you to borrow much more money than a Payday Loan, has monthly payments rather than weekly payments, can have lower interest rates, and you do not need to have a bank account. Payday Loans, also called Pay Day Loans, require you to make weekly payments, require that you have a formal job with regular paychecks, and that you have a bank account. This is why Title Loans are a much better option for many people. TheAutoTitleLoan.com is the fastest growing loan mart in Southern California for one reason - we promise you fast service without an attitude. Call our 1-800 toll free number, send us an email, fill out a form on this web site, or visit our main headquarters to get started on your quick cash loan today! "Can I borrow with Bad Credit?" At TheAutoTitleLoan.com we don't care about your credit. Bad credit, no credit, no problem! 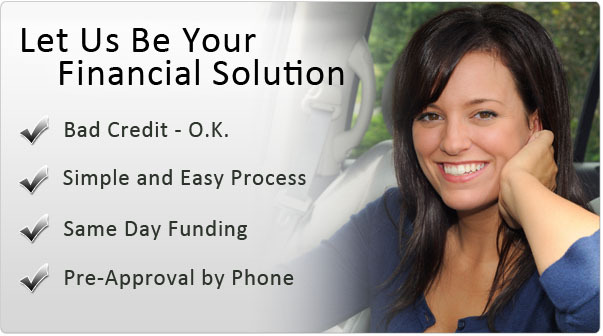 We will provide you with a loan based on the equity of your vehicle. We process your loan quickly- putting cash in your hand when you need it most. TheAutoTitleLoan.com is the fastest growing loan mart in Southern California for one reason - we promise you fast service without an attitude. Call our 1-800 toll free number, (800) 710-0068, for personalized service.